Responsive. Progressive. Dynamic. Occupant safety takes another leap forward with the 2012 Life Safety Code®! Nontraditional use of buildings...innovative designs...new technologies, materials, and construction practices. As the built environment and societal expectations change, so do the challenges to protect people from fire and related hazards. Fully updated to reflect the latest industry developments and lessons learned, the 2012 NFPA 101® raises occupant safety to a whole new level. For protecting lives in all types of occupancies -- assembly, residential, health care, industrial, and more -- nothing else comes close! 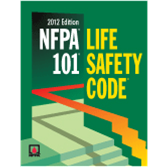 NFPA®'s Life Safety Code is the most widely used source for strategies for occupant safety throughout the life cycle of a building. Unique in the field, it is the only document that addresses life safety in both new and existing structures. From egress, sprinklers, and alarms to emergency lighting, smoke barriers, and special hazard protection, the LSC covers it! All new high-rise buildings must comply with the high-rise building package, promoting consistency in protection regardless of occupancy type. Revisions in health care occupancy rules foster a more comfortable, home-like environment.